The British Gas Training Academy has six locations throughout the UK and each centre is responsible for training new gas engineers in both technical capability and also customer service. The training teams use a range of innovative techniques to assist with their training programmes. 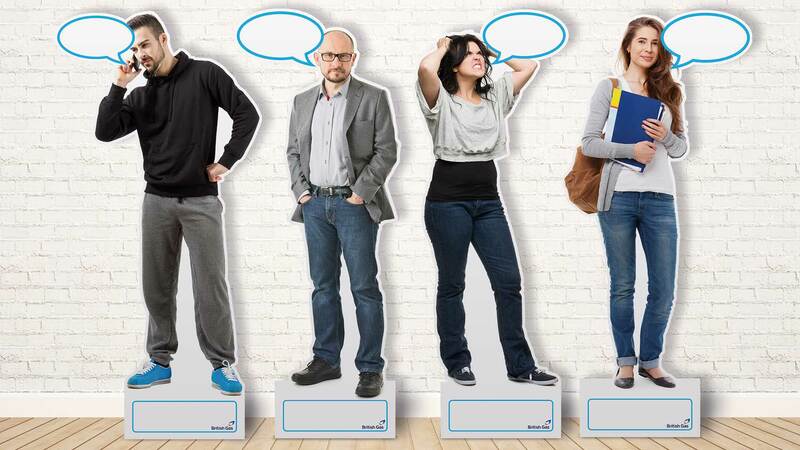 The customer service focused team in Leeds asked to have life-sized cardboard cut outs of 6 different customer types that would have a speech bubble where trainees could write what they thought their comments ware and a area at the feet of the customer that would describe the job type. The aim was to help develop a better understanding of customer sentiment and situation to better equip trainees on how to deal with different customers and situations. The material used allowed content to be written, wiped off and rewritten. On the back of a successful trial at the Leeds centre, the rest of the training centres ordered a further 7 sets of standees. "The stands arrived this morning and are excellent – went down extremely well. Can’t thank you enough for the quick turnaround."